In Japan, you can commonly see the cute mascots representing each town or city, for example, Kumamon from Kumamoto, Kyushu. Except Sarubobo in Takayama, there are also Hidachi and Shirakawago Kun representing Takayama and Shirakawago. They also have the identity cards in Japan!! Let me introduce briefly about Hidachi! Hidachi has a fluffy face and a little stomach. When I first met Hidachi in the festival of the weaver in summer, I find him super cute with the smile. He is actually taller than me and it is so comfy to touch Hidachi. Hidachi usually walk around the street during festival. Please say hi to him and don’t forget to give a hug to him!! 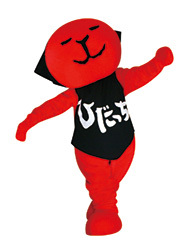 Shirakawa Gokun is the mascot of Shirakawago whom has a hairstyle of the Gassho-house roof.